Situated in the centre-south stretch of the Indian peninsula on the high Deccan Plateau, state of Telangana will be witnessing the Lok Sabha election just months after the assemby polls. The ruling Telangana Rashtra Samiti has won the assembly polls held with a huge win. 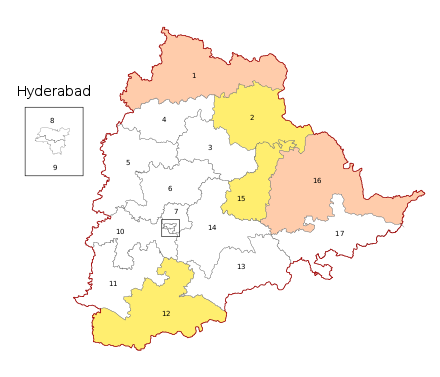 Elections in Telangana will be held in a single phase on April 11 in all 17 seats, including Hyderabad. The final counting of votes will take place on May 23. As per the latest reports, Congress party will go alone in the upcoming parliamentary election in Telangana. It will be contesting all the 17 Lok Sabha seats after the failure of the grand alliance experiment in the recent assembly polls. Congress party has won just 19 out of 119 assembly seats. Congress is very desperate to win at least 6 MP seats in the election. The party must re arrange its strategy since it has garnered a vote share of 32.32 %, while TRS has garnered around 47.4 %. votes. The BJP will be facing tough task ahead as it had won one seat in the recent assembly election. In the 2014 parliamentary electio, it won only one of the 17 Lok Sabha seats in 2014. Key leaders across parties: K. Chandrasekhar Rao, KT Rama Rao, Kavitha and Harish Rao from TRS; S Jayapal Reddy, actor Vijayashanti and Renuka Chowdary from Congress; Asaduddin Owaisi of MIM. Kolhapur, April 25 (IANS) The final round of fixtures in the group stages of the Junior Girls' National Football Championships 2019 came to a close on Thursday with Gujarat and Mizoram becoming the last two teams to book their place in the quarterfinals, which are set to begin on Friday. View More..
Hyderabad, April 25 (IANS) Opposition parties in Telangana on Thursday urged Governor E.S.L. Narasimhan to order a probe by a judge of the High Court into alleged irregularities in declaration of the Intermediate exam results. View More..
Hyderabad, April 25 (IANS) Nineteen students have committed suicide in Telangana during last one week over the failure in the Intermediate examinations, according to media reports. View More..
Hyderabad, April 24 (IANS) The Telangana Police on Wednesday arrested a student from Andhra Pradesh for making and sharing online a "derogatory" video about Telangana Chief Minister K. Chandrashekhar Rao. View More..
Hyderabad, April 24 (IANS) Telangana Chief Minister K. Chandrashekhar Rao on Wednesday ordered free re-verification of answer sheets of all the intermediate students who failed in the examinations. View More..
Hyderabad, April 24 (IANS) Two more intermediate students in Telangana on Wednesday committed suicide, taking the number to 10 since the results were declared last week, even as protests continued over the Telangana Board of Intermediate Education (TBIE) goof-ups. View More..
New Delhi, April 23 (IANS) With voting completed for third phase of Lok Sabha elections on Tuesday, all southern states have voted to elect their representatives - save one - to the lower house of Parliament. View More..
Hyderabad, April 23 (IANS) Fifty turmeric farmers from Nizamabad district of Telangana plan to contest the election against Prime Minister Narendra Modi in Varanasi Lok Sabha constituency to highlight their problems. View More..
Hyderabad, April 23 (IANS) Tension prevailed at the Telangana Board of Intermediate Education (TBIE) here for a second consecutive day on Tuesday as students continued their protest over the goof-ups in intermediate examination results. View More..
Hyderabad, April 22 (IANS) In yet another blow to the Congress in Telangana, senior leader and legislator Gandra Venkatramna Reddy Monday night quit the party and announced that he was joining the ruling Telangana Rashtra Samithi (TRS). View More..
Hyderabad, April 22 (IANS) Two persons, including a five-year-old, were killed and three others injured as gusty winds and unseasonal rains wreaked havoc here on Monday night, officials said. View More..
Hyderabad, April 22 (IANS) The goof-ups by Telangana education authorities in declaring the results of Class 11 and 12 have left students and their parents worried and also evoked protests from opposition parties and student groups. View More..
Hyderabad, April 22 (IANS) CLP India, one of the largest foreign investors in the power sector, on Monday signed a MoU with The Akshay Patra Foundation (TAPF) to set up a centralised Kitchen in Telangana to provide mid-day meals to 20,000 children daily. View More..
Hyderabad, April 22 (IANS) Online marketplace Flipkart on Monday opened its data centre in Hyderabad to strengthen its technology infrastructure. View More.. The Great Indian Election circus has just begun. View More..
Kolhapur, April 21 (IANS) After a thrilling first day of action, the second day of the Junior Girls' National Football Championships, here on Sunday, featured five games as the first round of fixtures in the group stages came to a close. View More.. Conventional wisdom has it that the current polls will not produce a clear-cut result as in 2014. View More..
Hyderabad, April 20 (IANS) The National Investigation Agency (NIA) on Saturday carried out raids in Telangana's Hyderabad and Maharashtra's Wardha in connection with an Islamic State module case, officials said. View More..
Hyderabad, April 19 (IANS) A senior Congress leader in Telangana on Friday alleged that Prime Minister Narender Modi is suffering from paranoid personality disorder. View More..